So cute! But I'm amazed you got those outfits on them without getting yourself torn apart! Those kitties must be very well-behaved. They are darling, but don't look all that thrilled. I know our dog wouldn't have stood for it. Those are ADORABLE! I couldn't have resisted either. You should have seen Finn after that picture - he was jumping around like crazy trying to get it off. Emmy was like "whatever". She's very good natured. I think they would have preferred a hit of catnip for Christmas! LOL that's just too cute! What an insult to kitty dignity! You have a very tolerant kitty there. The cat we had in childhood would have clawed our faces off if we had tried to make her that adorable. Looks like Emmy didn't even bother waking up to have her picture taken! She's too sweet. Adorable outfits! Too darn funny!! I'm sure they don't think so but hey!! Oh my gosh, your cats will let you do anything to them. This is just too adorable. Are they still following you everywhere you go? This is too cute! My boyfriend will not let me dress my kitty up for Halloween. He says that Zoey would hate me for life, but your kitties just look so cute! This is probably the cutest thing I have seen all month! They don't look upset about having them on either. My cats would probably claw me to death if I tried to make them try on those adorable outfits! Aw. My cats would be jumping around before I got something like that on them, not after! Oh I know they aren't happy. I put a little kitty reindeer ear thing on my cat last year and she was very, very upset with me. They sure are cute though so it's worth it! I told Kaitlin she definitely had to look at this picture! How frickin' adorable! 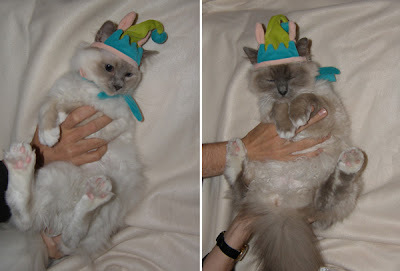 I'm with the others on here tho, Abby & Muffin would NEVER let us dress them up that way! They look adorable but none too happy. Buddy hates anything on his head so that wouldn't go over too well. lol.